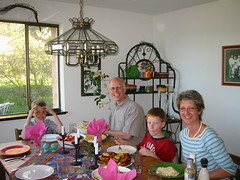 This evening we had the Ritzmans over for dinner. Dan and Carrie, along with their boys, Jeremie and Nathaniel serve in Brussels, Belgium as missionaries to Islamic refugees and immigrants. They work mostly with people from Morocco and Iran. Dan is from Harper Church and Carrie is from Nebreska. It was very enjoyable visiting with them and finding out more about their life in Belguim. They will return this summer after a year's furlough.